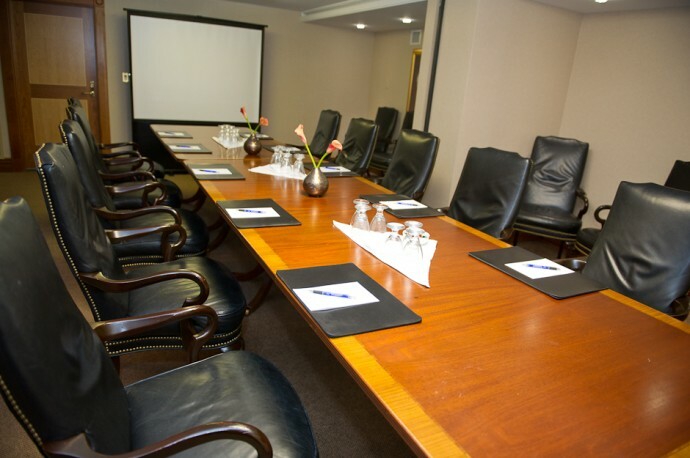 Located on the 2nd floor of the hotel, both the Lakeshore and Hurontario Rooms offer boardroom seating for up to 8, and define the kind of meeting space Mississauga needs: modern amenities with old-world charm. With plush, leather high-back chairs, modern audio-visual support and the service of a prestige hotel, these two boardrooms offer the opportunity to host your corporate meeting, sales presentation or seminar in comfort and style. The Lakeshore and Hurontario Rooms can be combined to accommodate 15 people, boardroom.It’s not just the comfort and appointment of the rooms that make these meeting spaces Mississauga’s best: it’s the service of our attentive staff, the availability of our award-winning Breakwater Restaurant for after-meeting dinners and the attention to detail that a fine hotel provides. So if you’re planning a small meeting, be sure to chat with us about how we can help make it a success. We know the needs of the experienced business meeting planner and we’re here to help.